When conductor Semyon Bychkov shows up at Orchestra Hall's door, he arrives dragging a steamer trunk with a giant orchestral score and its parts stuffed inside. * Two seasons ago, it was Shostakovich's Symphony No. 8—not a behemoth, but not a trifle, either—last year it was Strauss's Alpine Symphony. Last night began his weekend of Shostakovich's Symphony No. 7 ("Leningrad"), another of those pieces that requires the assistance of the local garrison's brass band. Written during the siege of Leningrad in 1941 and ostensibly depicting the never-ending Nazi onslaught, the first movement invites a certain amount of grandiosity and volume and fist-shaking as the march grinds on. But Bychkov pulled a fast one, literally, by starting out briskly and having everyone play the theme with some space between the notes. (One player quipped that the 900-day siege of Leningrad only took 50 in Bychkov's version.) The lack of lyricism kept everyone on their toes, made it lighter, and helped Bychkov clarify the textures. Counterthemes were actual partners in the dialogue, and prodded the main theme on. Every instrumental choir was audible in there, and what could've been sonic mush was a collection of piercing choirs. It did get plenty loud, but managed to be overwhelming without being sloppy, and taut the entire way through. Bychkov also showed tremendous skill in keeping the third movement from bogging down and shaped that movement grandly. The flute duet sticks out in my memory as an especially fine moment, but Bychkov kept the movement flowing so easily that the duet felt less like a bauble and more like a piece of a collection. Even in the finale, Bychkov kept everything on an even keel, up to and including when the row of brass reinforcements stood for the final statement. (Is this normal? The brass often stand at the end of Mahler's First Symphony, but I don't know what performance history exists for the Shostakovich. Dr. Taruskin, are you reading this?) The agitated section with the syncopated pizzicatos jumped out, because the players adopted the so-called Bartók pizzicato, which snaps the string against the fingerboard. It sounded like an enormous whip cracked against the floor of the stage. Pianist Yundi Li showed up to play Ravel's G major Concerto first on the program. He has a shy demeanor, doesn't draw a lot of attention to himself when he's walking onstage, doesn't wear flashy clothes—and there's a bit of a blank when it comes to his playing, too. The second movement swam about in a series of pastel shades, with practically no definition to his playing, and he tapped out these bizarre accents in the opening solo that negated any sense of repose. Michael Henoch played the English horn solo well. A tight sense of ensemble was pretty lacking in the first movement, suggesting rehearsal time had been spent elsewhere, but Li did rise to the occasion by the final movement, which crackled. If I were an enterprising pianist or presenter, I'd organize some sort of tour where I played Shostakovich's First Concerto and the Ravel G major, to demonstrate how both were influenced by vernacular music, or put Ravel's Rapsodie Espagnol on the same program as Stravinsky's Firebird, and let people hear how exactingly Stravinsky mimes Ravel. But I'm not, so I'll throw them out there, and see if someone copies me five years from now. *Bychkov does not actually travel with his music in a steamer trunk, as far as I know. What's the famous recording, the touchstone interpretation of a standard repertoire symphony or opera that you've never heard? Bernstein's Mahler? Carlos Kleiber's Beethoven? Alfred Brendel's Mozart? Brass players, never actually listened to that CSO/Cleveland/Philly Gabrieli disc? Violinists, Heifetz's Brahms Concerto somehow never manage to get into your CD player? And how about you singers, you're always the most aggressive devotees of recorded music; would you recognize Fischer-Dieskau's Schubert if it swanned across your stereo? We're all experts in the blogosphere, so now's the time to let everyone know what recording you've been meaning to purchase, but somehow never did. We all have 'em, folks, and, apropos of this week's Chicago Symphony concerts, mine's the disc above. (There are others, but that's the one that leaps to mind.) 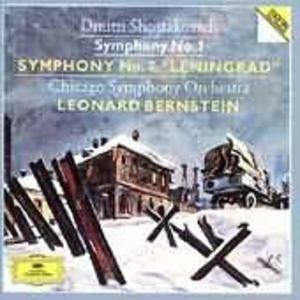 Despite numerous exhortations from Shostakovich and brass enthusiasts alike, I've never heard Bernstein's 1989 recording of the Seventh Symphony ("Leningrad") with the CSO. My guess is that it's loud. Answer in the comments, which are open now, and may never open again. Confession is good for the soul, they say. "Do you see how [easily] any of us can be misled by appearance?" "Perhaps that is why beauty is such an advantage, my lady." I'm more thankful for my mental health. I'm also thankful for a loving family, and a newly growing group of friends. I'm thankful for Grand Haven, Michigan. I'm thankful for hot soup on a cold day, and linen pants in the summer. I'm thankful for second acts, in every area of life. I'm thankful for great orchestra concerts. I'm thankful I don't have a defaulted subprime mortgage, but do have a warm apartment. I'm thankful for the many, many friends I have in New York, and those who are flung across the rest of the country. I'm thankful for collar stays that keep my collars from looking unkempt. And cufflinks that people notice. I'm thankful for my iPod. I'm thankful for Per Petterson. I'm thankful I have a job where I can meet so many interesting people, and they pay me to do that. I'm thankful people still return my calls after I write unkind things about them. And thankful people remember the positive things I write. I'm thankful for texting (for CMD). But it's nice to be home. The gloriously long hair is now mostly gray, but Martha Argerich possesses the energy of a teenager. Now 66, the legendary Argentinian pianist still plays with incredible clarity and power both benefiting mightily from a dynamic range that extends from thunder down to a barely audible whisper. The simple dexterity is nothing short of amazing, but the musicality she brought to Prokofiev's Third Piano Concerto, now, that's something you don't hear every day. She came with the UBS Verbier Festival Orchestra and conductor Charles Dutoit to the Harris Theater last night as part of the youth orchestra's tour, and in a world awash in youth orchestras, this one stands out for its cosmopolitan tone. (I compiled a brief list in the opening of this article.) Violins are bright and piercing, cellos don't resonate deeply; they're more like a chorus of light baritones. The woodwinds, well, it's hard to come to much of a conclusion on a single concert, but they don't seem to pride themselves on a finely blended ensemble. It's more a collection of soloists fighting for glory back there. The horns struggled often with pitch in both the concerto and Berlioz's Symphonie Fantastique, but criticizing the horns for audible mistakes is the absolute hands-down easiest sport for a critic. I saw one violinist last night correcting a stand-partner who was hopelessly lost, but you couldn't hear her screwing up. The orchestra is, on first hearing, a couple places higher on the achievement scale than the Civic Orchestra, but not at the level of Daniel Barenboim's West-Eastern Divan Orchestra. Both of those play together more often with a single conductor than this festival and touring orchestra, so you have to give the Verbier group some praise for what it does do so well. Dutoit and Symphonie Fantastique are practically synonymous, or they should be, so his calm authority came as no surprise. But the spectacular rage he brought the final movement won't be forgotten, nor will the insanely high level of control he wielded so that every line came through so clearly in that maelstrom. Watching Dutoit conduct the accompanying instruments and letting the melody's players handle themselves is to see a conductor putting the piece front and center, and the way he manages to show how a piece is built without it turning into a dry exercise is always fascinating. This is the second time I've seen him do it with the Berlioz, and each time there's some detail turned up, some line given new prominence. This time it was the low strings and bass drum in the last movement playing offbeats to the Dies Irae that crescendoed with formidable menace. With Argerich, she's 66, she's a ferocious technician, her phrasing is under such cool control that it takes your breath away, and she can play those twisting, exposed scales in the concerto's first movement entirely seamlessly, and, on top of it all, she never sounds clattery in a piece that lends itself to a mechanical approach. If we needed Seven Wonders of the Classical World, she must be near the top, so sure is her command of the instrument and the music. She sounded as if she were making up that concerto as she went along last night, casually moving from intricacy to chords that could create shockwaves. She played two encores, Scarlatti's D minor sonata and Chopin's f-minor Mazurka, Op. 63, No.2. The Scarlatti showed off her impeccable technique again with its repeated notes, each of which had the exact same weight as the preceding one. For their part, the orchestra played the "Farandole" from Bizet's L'Arlésienne Suite and Chabrier's España after Symphonie Fantastique. Both had that charm and dash that's the mark of great French orchestras, along with the Montreal Symphony under, of course, Charles Dutoit. It is 2:30, and therefore time for me to go down the street for a cup of coffee and a cookie. That time falls at different times on different days; most often, it is when there is a pile of work to be done, but which I am determined to procrastinate from completing just a little while longer. The rock listings may be crying out for a stiff fact-check ("Please!" 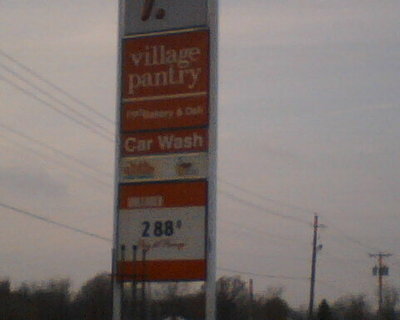 I hear them begging, "Our prices are incorrect, and our starting times may be off by as much as half an hour! We need you! "), but I am determined to ingest sugar and caffeine if it is the last thing I do, and given my mood at this hour, it just might be that last thing. I walk down one block without incident, but as I begin down the second, I see a woman in a clean sweatshirt leaning over a grate in the street. She's bent double at the waist, feet on the sidewalk, peering down. She shakes her head, then nods, and says something I can't make out. She shakes her head again, quickly, as if trying to shake something free from her mouth. Is she spitting into the grate? I get a little closer, and she says something again. I still can't understand, then she shakes her head, shrugs, and walks away. She had, of course, been talking to someone under the grate, I understood then. I peer in myself as I walk by, just to check, and of course see nothing. We must be in end times when even the normal-appearing people are inventing companions to talk with, especially if those companions are far below street level. Two editors of The New Idiom, the student newspaper of the Illinois Institute of Technology's Institute of Design, attended the MusicNOW concert last Monday night, and share their thoughts here. To go all sociological for second, a few things stand out here. One, that these are the kind of analytical listeners and minds new music is searching for, and that they seem to have found in this case; two, they're now writing about their experiences, which exponentially increases the reach of their experience; and three, they were able to talk to Nico Muhly at the reception and figure out where his wild ideas came from. This combination of open-minded listeners + access to the blogosphere + personal connection with the artist gives newcomers such a potent connection to the music that they are much more likely to come back. I don't know if their feelings were shared by the other 898 listeners, but the response of these two students speaks volumes.